A couple of months ago I experimented with ballpoint pen as the drawing medium in my journal. I had been using graphite. That worked well, and I often only used a mechanical pencil with HB lead. If I wanted it darker I would use some darker 4B or others. Then I'd have to spray it with fixative to keep it from smudging. I had also been using colored pencils, but that is an extremely slow medium. I wish I could remember what article I read or video I watched that was the inspiration for going to ballpoint pen. But when I tried it I was immediately impressed. 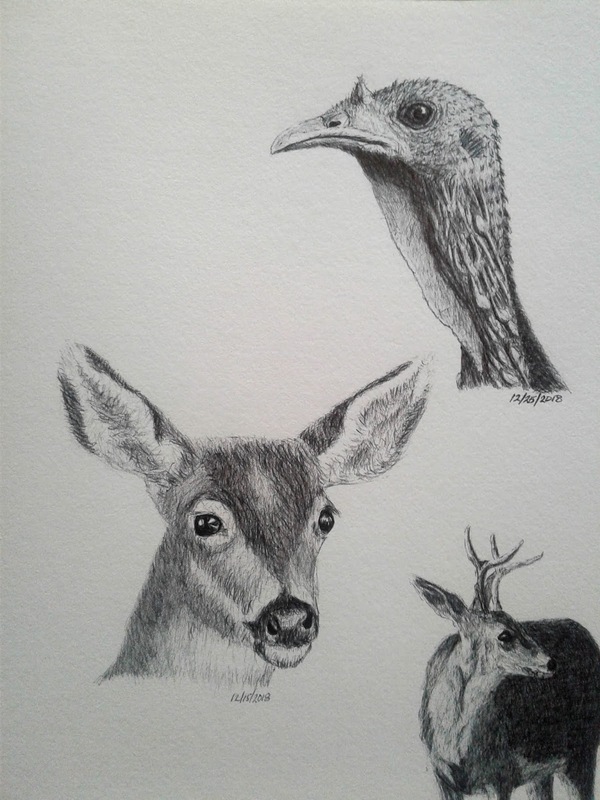 You can actually use the same shading technique with ballpoint pen as graphite pencil! When you push harder more ink is released, when you let up the pressure the ink is lighter. This is only for ballpoint; other pen types lay down an even amount of ink whether pressing hard or lightly. Because the ink will not smudge I can journal on both front and back pages, unlike pencil (until sprayed with fixative). Some people make an initial sketch in graphite pencil and then ink that. But that doesn't save any time over graphite alone. Rather, start drawing lightly in ballpoint pen (expecting that your first marks will be wrong) and just go with it, strengthening the lines that are correct. It is rather freeing to draw without erasing. 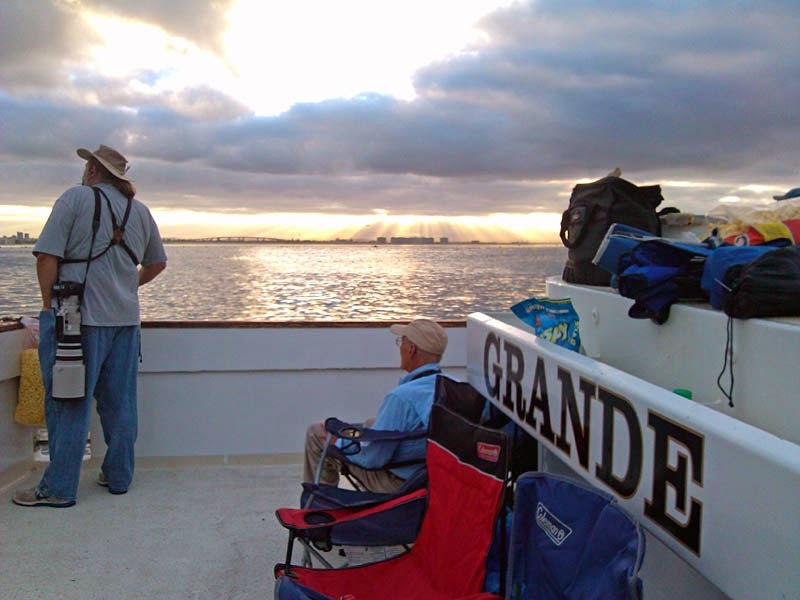 Most of my nature journaling is not done in the field as taught. Rather, I photograph profusely and then draw from photos. In the example following I drew from photos, primarily freehand. 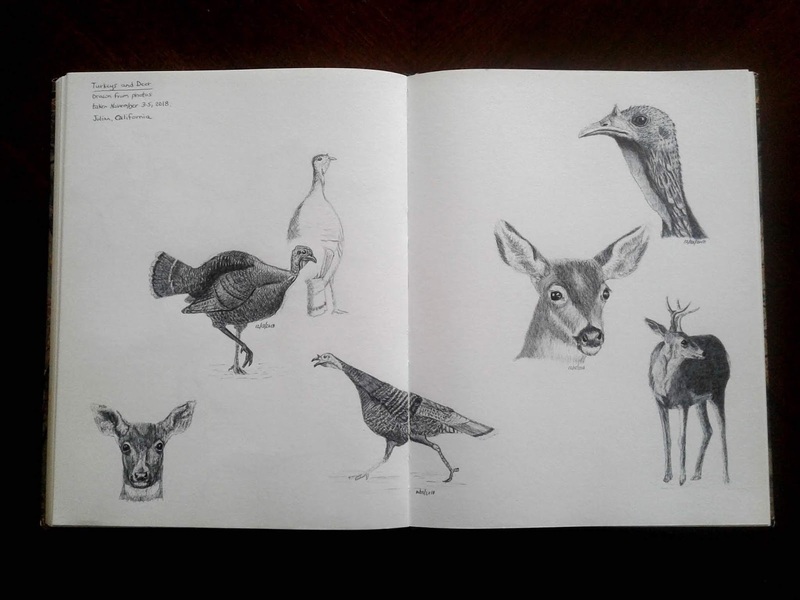 For the turkey profile and the one running from page to page I used a grid and pencil sketch to get proportions right. Here is a close-up. If you click on the photo and look close you may see a few of those stray barely-visible faint "wrong" lines. While the above "finished" drawings took a bit more time, the sketches on the following page were done more quickly. 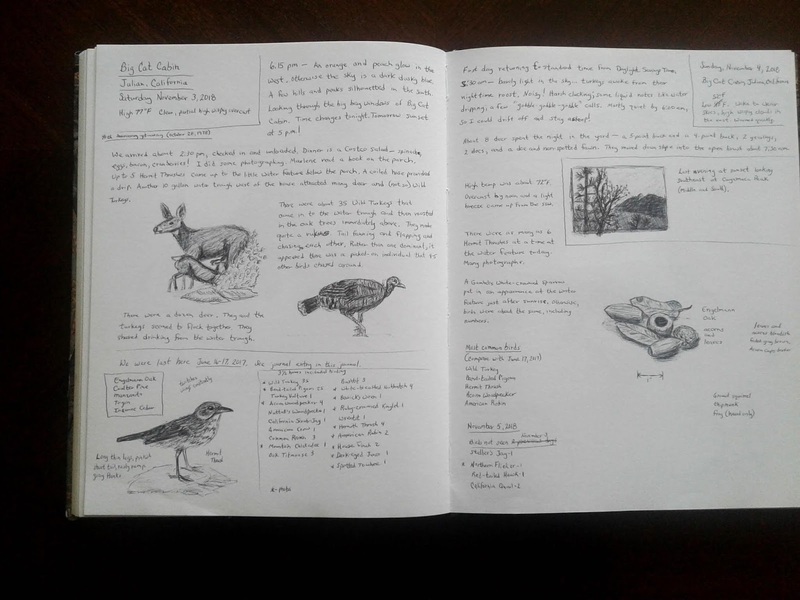 Nature journaling is "not about the art." It is your observations and impressions that matter. The sketches bring back to mind. They don't try to perfectly replicate what you saw. Some of the nature journaling instructional books I have use rather quick, crude, drawings. I'm trying to emulate that quick nature and curb my perfectionism. Some of the time, anyway. 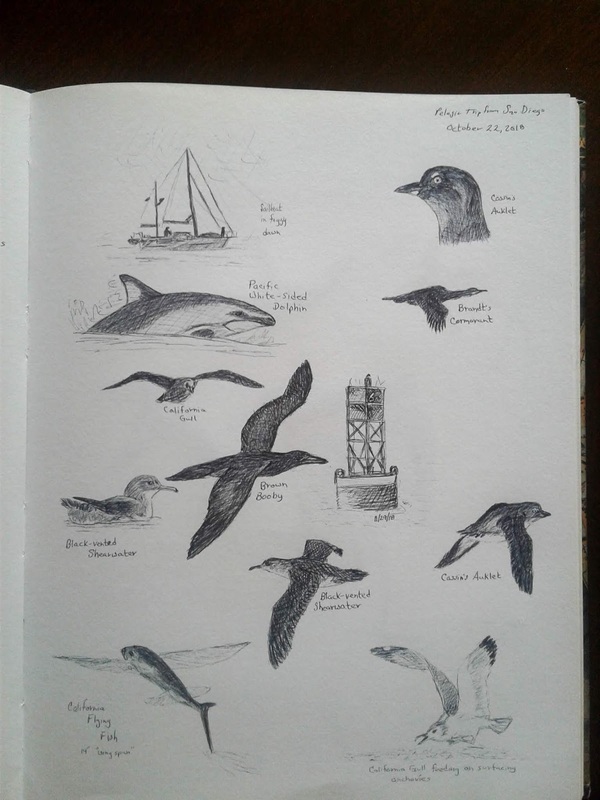 Impressions from my pelagic trip. One downside of ballpoint pen ink is that it will fade, especially if exposed to sunlight. So it's perfect for a journal.